From version 1.0.16 our tool now supports Outlook Mac ver 15/16 for Office 365, while still maintaining support for Outlook 2011. This new version of Outlook is a considerable improvement over 2011. Please see our downloads section to get the latest release. 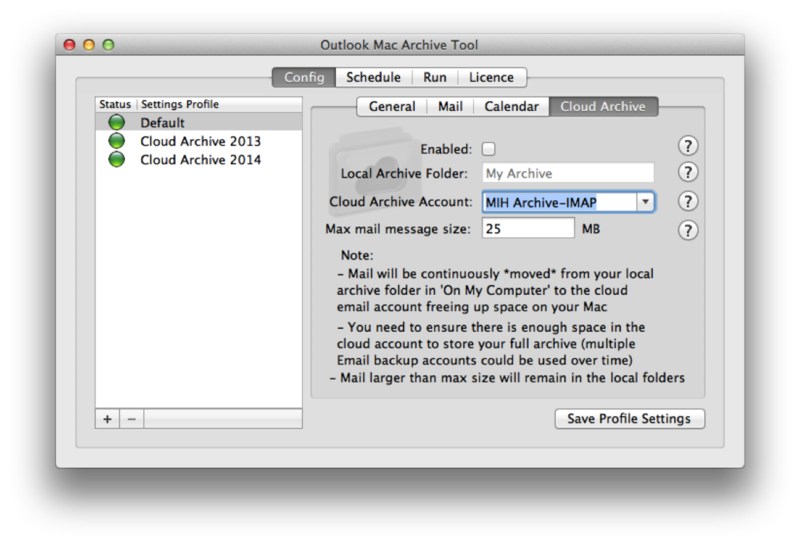 Outlook Mac Archive Tool is a native Mac application for managing your mail and calendar items in Outlook Mac for Office 365 and Outlook Mac 2011, including archiving not just to your local hard drive/storage but also optionally to the cloud (such as a GMail account) . Archiving to the Cloud can ultimately free up space on your Mac and give you access to your archive anywhere in the world, safe in the knowledge your archives are backed-up and searchable. 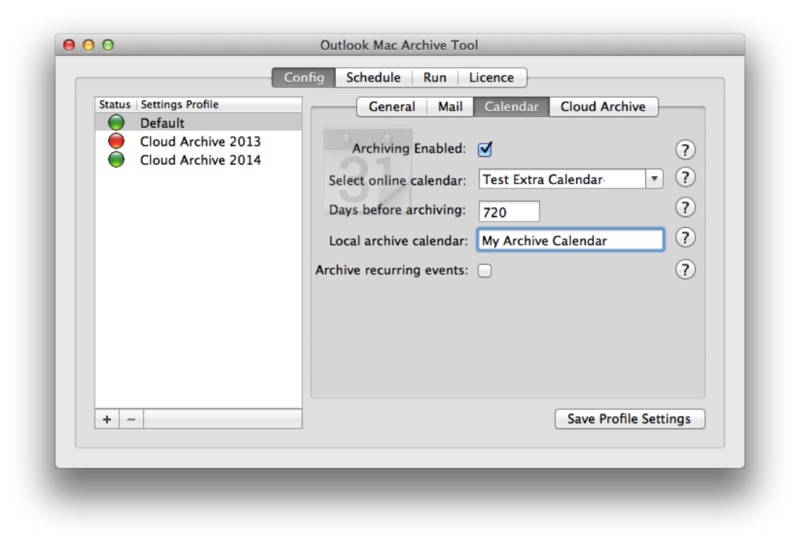 Cloud Archive – Archive any local folder to a GMail, IMAP or even a second Exchange Account. Once backed-up space can be freed up on your Mac. No loss of data when your device fails and access years of archives anywhere in the world and with full search. If you are a corporate technical Administrator please contact info@7thdomain.com to get details on bulk discounts. You can download an unactivated trial version of this software. It can simulate all archiving operations and reports but will not actually move any mail or calendar items (runs in simulation mode). In this way you can ensure it operates to your satisfaction before purchase. To make the software fully functional you need only purchases a licence code and enter it in to the Licence tab of the software to activate it. Powered by 2Checkout.com Inc. (Ohio, USA), a payment facilitator for goods and services provided by 7thDomain. I’ve been using this happily for quite a while and it worked well. Just migrated to OS 10.11.1 El Capitan and 15.14.2 Outlook for Mac. I think one of them is incompatible – probably El Capitan – but its hard to tell as I had archiver working in the background and can’t remember when it stopped working. Sorry to be vague. The app loads but gets stuck as soon as it attempts to run an archive. Hopefully you’ll get a chance to take a look at this in the future and see if there is any tweak required? This is brilliant and I plan on getting this for MAC users in the office this week. I’ve been using the GITHUB code for a while now but as an application it’ll be easier to manage with policies. Do you know if there is a PC equivalent at all? Unfortunately the PC solution isn’t as workable. The idea of folder replication and a true days to archive isn’t something that I’ve seen in Outlook for windoze. I’ll keep searching for something for those users. I’ve implemented your original GITHUB code and love it, so I’m assuming this application is an expanded version with beautiful gui. well done for a rad solution. If you enabled cloud archive then the mail is sitting in the offline cache of the IMAP/Gmail account and a copy stored online (once synchronised). 1) Improved options on message/calendar selection (i.e., greater then a certain size). This would allow setup of a profile to archive very large messages earlier then others. 2) For recurring calendar events, does it also archive those events that are still occurring then? Not clear on that. If it does, any way to check the recurrence so that it does not do so? Or potential then with an additional checkbox to then only archive any individual entries of a recurring event (i.e. when a meeting room was changed or so). 3) Ability to also do Archive from 1 folder to another on “My Computer”. Might sound silly, but it would allow to organize in different methods (for example different folder for each year). And especially for Calendar events as we can not just move them in Outlook (grumble). 4) Option to have it check if Outlook is running and connected to Exchange before running the schedule? And if Outlook is not running, or not connected to Exchange, then try again some time later. I work from home and VPN into work, hence not always connected to Exchange and definitely don’t always have Outlook running. Don’t want it to be started then and start asking for password cause it can’t connect to Exchange. Can I use this tool to achieve the following desired functionality? – Auto delete items in ALL folders, inbox, sent, deleted, junk (and subfolders) that are older than 90 days EXCEPT for items that have a specific category added (in this case the category is called ‘Archive’). If it can’t auto delete but can move them to the deleted items folder instead that is fine too. Very much hoping it does!! Does your tool able to archive Calendar items as well? If it does, what would happen, if the Calendar item is a recurrent event? 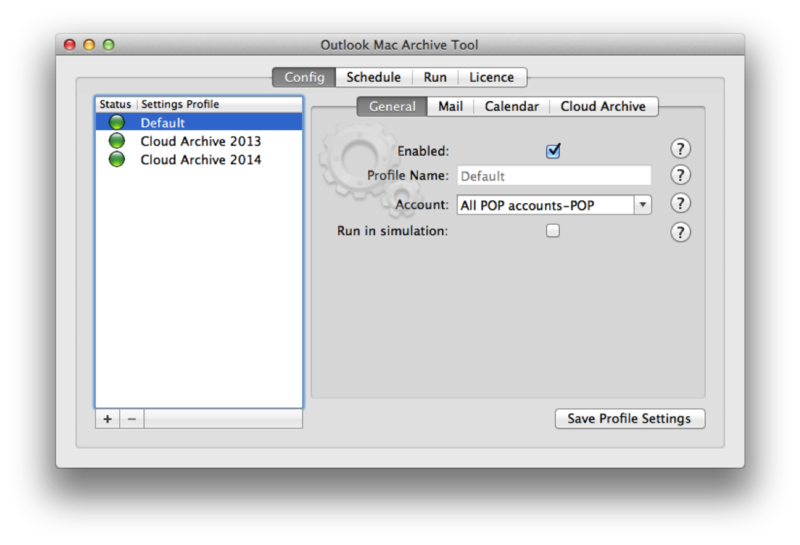 Hi Ching, yes our tool supports archiving of calendar events (for exchange accounts only as IMAP/POP accounts have no online concept of a calendar in Outlook). It’s useful if you have a long history of calendar events that have attachments which are consuming your online quota of space on Exchange. We have catered with an optional checkbox as to whether you want to also archive recurring events which is by default off. I Like the look of this very much – my Outlook file is growing so large that it won’t properly connect to the server. Can I use this tool to archive, say, all files prior to 2012 to a folder on my back up drive? I’m not fond of the Cloud just yet. And then be able to access and read these files if I need to find something in there? If I can do this, I’m In! I had to move from a personal mac at work to a corporate one, but I’m downgrading from 500gb to 128gb hard drive. 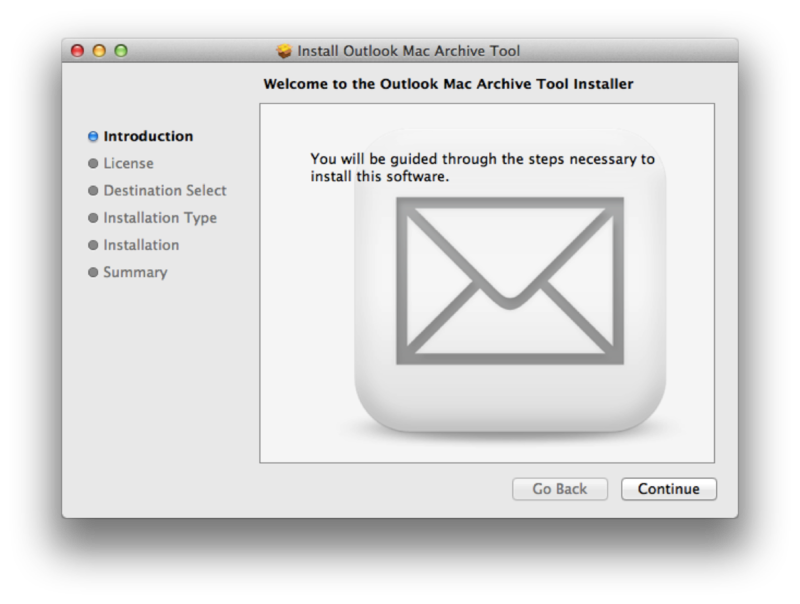 Therefore I can no longer have my outlook for mac archives stored on my new Mac (c.a. 50gb). I now have 46 .mbox files on an external hard drive ready to be uploaded anywhere. Can you confirm that your soft could help access these archive files from my outlook while making sure that I can search them through the Outlook 2011 search box? Our tool doesn’t work at the file level. 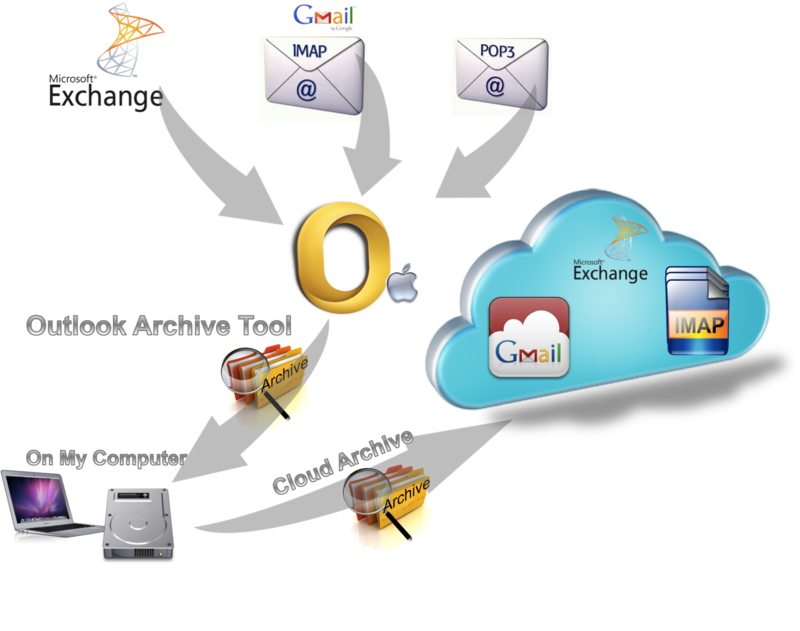 It will take mail stored under ‘On My Computer’ in your local archive and move it (maintaining folder structure) into a cloud mail account that you have setup in Outlook such as a Gmail account. However your mailbox size is larger than a single cloud account of 15GB typical of Gmail. You can overcome this with multiple gmail accounts (say one for each years of mail archived, contact us on support for help in solving this issue). 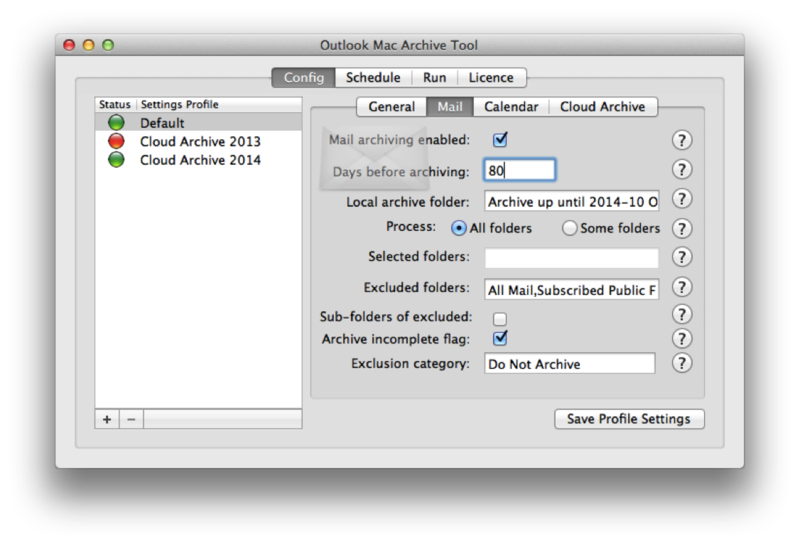 Once mail has been moved over to your cloud mail account(s) then it’s searchable online and in Outlook. However, to save space on your local drive you then can unmount the Gmail accounts from Outlook and have them only searchable through the web interface of Gmail. Hope that makes it more clear. I have a MacBok Air that I’m trying free up space. I just purchased a Synology NAS and have that set up. I have an old work email account in Outlook 2011 that I would like to move to my NAS and still have access to it. It is no longer a live email account since I left my old job but I still use it to reference things. I don’t use it everyday or even every week but I need the availability when needed. 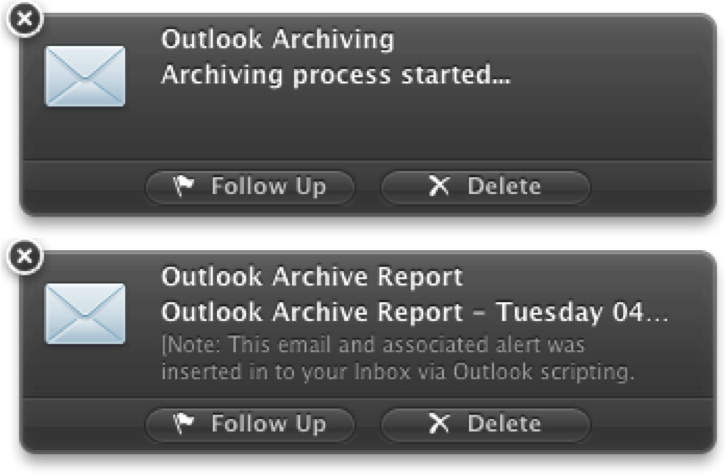 I also use Outlook on my Mac for personal email and don’t need to archive those accounts. Would your tool work for this situation? If so how would I do that? Hi Greg, I’m assuming your old work emails are sitting in a folder somewhere in your local computer (under On My Computer). If so then our tool supports pushing this mail in to a cloud mail account such as a gmail account (or any IMAP account with sufficient space). It’s often best to create an account just for this purpose. Once you have pushed the mail there then you can unlink the Gmail account from Outlook freeing up space on your machine and then only access the mail through the web interface of gmail. See our user guides for further info on cloud archive. In terms of your NAS, Outlook doesn’t support the concept of mounting one mail account on a separate storage device such as a NAS. You could manually back up your entire database there but it won’t free up your mail on your active mail client machine. Yes, this tool supports the feature of pushing mail to a cloud mail account. This keeps your mail accessible and searchable rather than locked up in some form of file storage. The cloud archiving moves the mail away from On My Computer to your cloud account. Once you have moved it there you can remove the cloud account from Outlook and it will free up space on your Mac. You can then access your legacy mail via the web interface of Gmail or whatever cloud service you chose. When I create a new profile, then select “Some folders”, then enter the name of the parent folder, the tool archives the parent but skips the subfolders. Is it necessary to list all of the subfolders too? I noticed that if I list the parent folder and also the name of a subfolder (without specifying a folder path), it archives both. But my parent folder has _MANY_ subfolders, so I’m hoping that there is a way to archive the parent and all of its children without having to list all of the children. Hi Kevin, yes the some folders only selects the folders listed by design but a number have requested the feature of sub-folders too so I will look in to it. Is there the possibility you can select all folders and then just exclude the ones you don’t want? When you exclude folders it includes excluding their sub-folders unless you override that. Hi Brad, the sub-folder was chosen so as to not clash with the On My Computer folders of Inbox etc. These folders are used for POP accounts to download in to so your mail from your ‘Online’ accounts (IMAP, Exchange) would mix with your POP accounts. Does this tool archive to the outlook identity or does it archive to an actual archive file such as .olm? The reason I ask is the Identity becomes corrupted frequently. Also, can it be set to archive to a network location? Thanks. Hi Brian, it has two archiving processes. It simply moves mail in it’s folders from your working online account down to ‘On My Computer’. The value of this is that it frees up your online account especially if it has storage quotas etc. This effectively all happens within the single identity and I agree that Outlook suffers from many identity corruption issues. This is why I wrote the ‘Cloud Archiving feature’ which basically moves mail from your ‘On My Computer’ to any other mail account of your choice. 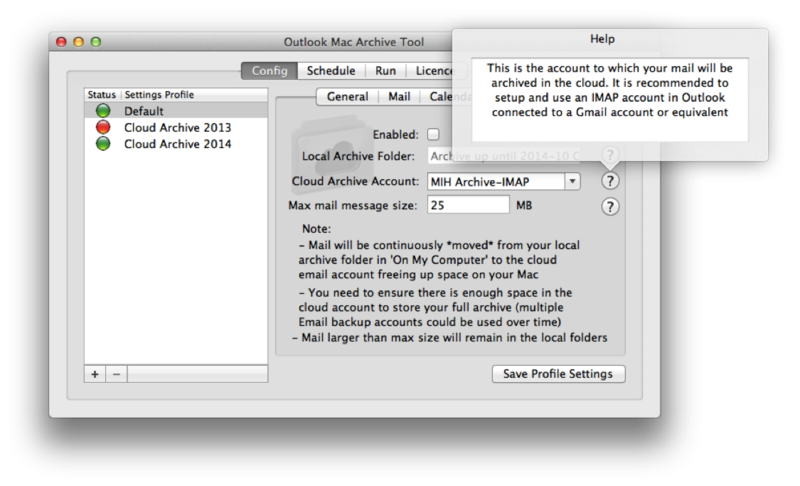 So for example if you setup a second account in Outlook mapped to a Gmail account via IMAP (e.g. myarchive.work.2014@gmail.com) it will archive (in realtime) from your working active account via On My Computer out to the cloud mail account. This cannot get corrupted as once it’s been uploaded in to GMail and your identity corrupts you simply install a fresh outlook and connect back up your working account (often exchange) and your archive Gmail account and they all come back down in to your new Identity from the cloud. So in that sense it is a backup to a network location but not on your LAN but in a cloud mail account that is searchable and accessible from a web interface (or mounted in Outlook) rather than stuck in an OLM somewhere on a drive. If you didn’t trust Google (though Google is 100 times more secure than most private mail environments) you could in theory setup an internal IMAP server that is used only for archiving and it runs on slow storage rather than the high speed stuff powering your exchange servers. So glad I stumbled across this site and subsequently purchased a license. Its made my life easier (and my sub folders happier). App does exactly what it says on the tin – and better by far than any other solution by archiving to the cloud too. We’ve just had an influx of Mac’s in the workplace and will recommending this to all my associates, colleagues and management. Awesome product Michael, keep up the good work! 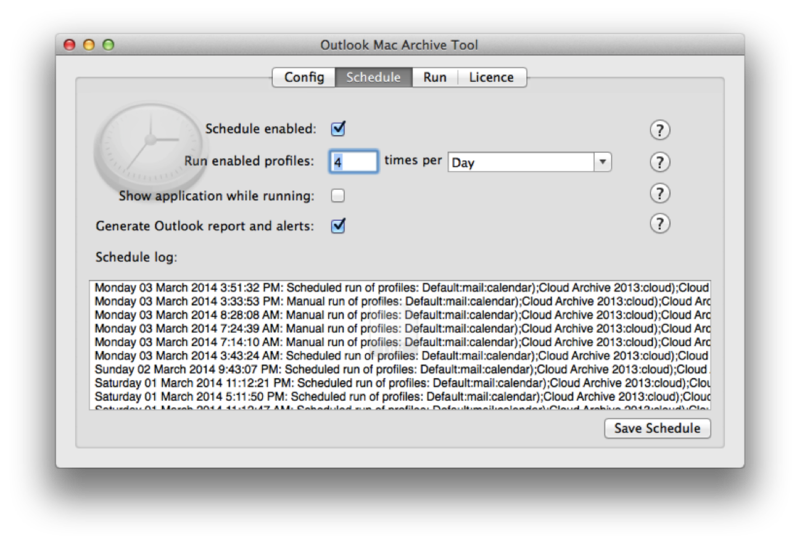 I am running Outlook 2011 on a Macintosh. I have stored much of my mail on my computer. The emails are in separate folders that are alphabetical by name. 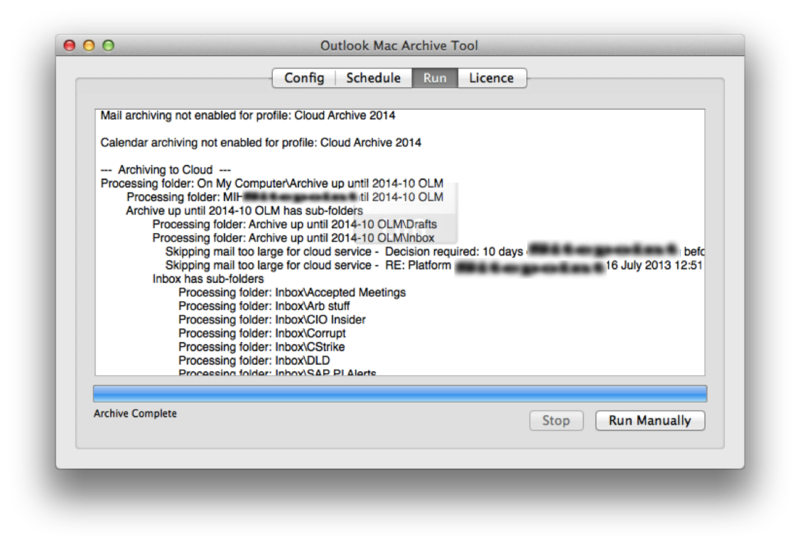 If I want to archive emails older than say 180 days will Outlook Mac archive tool preserve my subfolder structure? Hi Marc, the tool always maintains the folder structure of your source. If you are archiving from say a work account to local storage, then whatever folder structure you have in that account will be replicated down on to ‘On My Computer’ underneath a root archive folder which you can name (the ‘Local Archive Folder’ field under the ‘Mail’ tab in the app). If you use Cloud Archive then the source is On My Computer and it will replicate from a root folder (including it’s sub-folder structure) out to the Cloud account. Well, when you’re ready, I’m ready to help test 🙂 I have a few boxes I’ll eventually need to buy this for (unless somehow MS releases an updated Outlook for Mac!). Thanks! I would love to give this a try for you, or purchase when you have everything set up. Auto-Archiving on the Mac is something that I have been trying to deal with for a while. How do we purchase an activation code ? Hi Daniel, thanks for checking it out, I think you are the first! 🙂 I’m just in the process of selecting and setting up a payment provider. Check back in a few days and hopefully it will be enabled.